This lesson will focus on the views of the founders as expressed in primary documents from their own time and in their own words. Students will see that many of the major founders opposed slavery as contrary to the principles of the American Revolution. Students will also gain a better understanding of the views of many founders, even those who owned slaves – including George Washington and Thomas Jefferson – who looked forward to a time when slavery would no longer mar the American Republic. Students will become aware of the obstacles – real and imagined – that ultimately led to the failure of the founders to achieve immediate emancipation in 1789. At the same time, students will see that the people of many states did take action to gradually emancipate slaves, while in other states legal sanctions were enforced to make manumission of their slaves more difficult for slave owners. How did the American founders' views on slavery shape the creation of the republic? Students will compare the views of prominent American founders regarding slavery and evaluate the extent to which they reflect the principles of the American Revolution. Students will analyze the plans proposed by the states for abolishing slavery. Students will evaluate the short and long-term ramifications of these decision across U.S. history. In the years leading up to the Civil War, the views of the American founders with regard to slavery became an important issue. President Abraham Lincoln and former slave Frederick Douglass argued repeatedly that the American founders believed slavery was contrary to the principles of the Declaration of Independence and meant to put the nefarious practice on the path to extinction. Others, such as Senator Stephen Douglas, claimed that the founders had intended to leave it to the people of each state to decide whether they wanted slavery or not. And Abolitionist leader William Lloyd Garrison accused the founders of perpetuating slavery forever through the “infamous bargain” or compromise made with slave states during the Constitutional Convention. In hindsight it would seem that there is some ground for all of these claims. One object of this lesson is to allow students to see for themselves what the American founders actually said and did with regard to the institution of slavery. At the time the United States declared independence from Great Britain, slavery legally existed in every state, North and South. But as Americans fought to establish self-government and fulfill the principles expressed in the words of the Declaration of Independence, many recognized the great tension between the idea that “all men are created equal” and the injustice of chattel slavery. Slavery had existed in America for over a century, but it was specifically the principles of the Revolution that clearly demonstrated the injustice of the institution, and many Americans hoped for its immediate abolition along with the end of British rule. Thomas Jefferson, for example, in his Summary View of the Rights of British America, wrote that “the abolition of domestic slavery is the great object of desire in those colonies, where it was unhappily introduced in their infant state.” Indeed, in his draft of the Declaration of Independence, Jefferson included an indictment against King George III for waging “cruel war against human nature itself, violating its most sacred rights of life and liberty in the persons of distant people, who never offended him, captivating and carrying them into slavery in another hemisphere.” It was under the tyrannical rule of Great Britain that the importation of slaves into America had peaked, and now, many Americans hoped, the Revolution would lead to the establishment of a nation of freedom for all men, white and black. Jefferson was not alone in his hatred of slavery. George Washington, the great general of the Revolution and first President of the United States, wrote that his employment of slaves was “the only unavoidable subject of regret” in his life. After the Revolution, Washington wrote to a friend, “I never mean … to possess another slave by purchase; it being among my first wishes to see some plan adopted by the Legislature by which slavery in this Country may be abolished.” Washington resolved to make his own slaves “as easy and comfortable in their circumstances as their actual state of ignorance and improvidence would admit, and to lay a foundation to prepare the rising generation for a destiny different from that in which they were born.” In his will Washington stipulated that his slaves should be freed upon the death of his wife. He could not, he wrote, with good conscience free them sooner, because many had married with the “dower” slaves of Martha’s family, whom he could not legally free; the result would have been that freed husbands, wives, fathers and mothers would have to live with enslaved spouses or children, which could produce “painful sensations, if not disagreeable consequences.” Washington also established a fund out of which the older slaves were to be supported for the remainder of their lives; the children of the freed slaves were “to be taught to read and write; and to be brought up to some useful occupation”; and Washington “expressly forbid the Sale, or transportation out of said Commonwealth, of any Slave I may die possessed of, under any pretence whatsoever” in order to keep as many families intact as possible. Washington realized that this was little compensation for the injustice of slavery, but it was all he could do, given the laws of the state of Virginia at the time concerning the manumission of slaves. The great difficulty at the time was, of course, how such a deep–rooted problem, which had become so ingrained in the way of life of Americans in some parts of the Union, could be eradicated and corrected in a way that was compatible with the safety and happiness of all. The seriousness of this question came to a head at the Constitutional Convention itself, at which time it became apparent that certain states – most notably South Carolina and Georgia – would likely refuse to join the Union under the proposed Constitution if slavery were abolished outright. John Rutledge of South Carolina stated the issue succinctly: “Interest alone is the governing principle with nations. The true question at present is whether the Southern States shall or shall not be parties to the Union.” Mr. Charles Pinckney and General Charles Cotesworth Pinckney, also of South Carolina, argued that the national government should have no authority whatsoever with regard to slavery, including the power to ban or regulate the importation of slaves. Such arguments illustrate the degree to which the economies of South Carolina and Georgia depended on slave labor. However much they might personally wish the extirpation of slavery, the South Carolina and Georgia delegates realized that it was a question of economic self-interest. As General Pinckney claimed, “South Carolina & Georgia cannot do without slaves.” Oliver Ellsworth, anti-slavery delegate from Connecticut, summed up the problem as follows: "All good men wish the entire abolition of slavery, as soon as it can take place with safety to the public, and for the lasting good of the present wretched race of slaves. The only possible step that could be taken towards it by the convention was to fix a period after which they should not be imported." Legal measures to emancipate the slaves would have to take place at the state level, and these efforts began even before the Constitutional Convention. In two states – New Hampshire and Massachusetts – slavery was ended immediately by state court decisions in the early 1780s. In other states – Pennsylvania was the first in 1780, followed by Rhode Island, Connecticut, New York and New Jersey – plans for gradual emancipation were implemented, usually by granting freedom to slaves once they reached the ages of 18-28, and in these states the numbers of slaves decreased greatly between 1790 and 1810. Other states – mainly in the American South – refused to implement plans for gradual emancipation and retained laws that placed strict limitations on private manumissions, with the result that slave populations rose sharply between 1790 and 1810. Thus the greatest proportion of increase in the nation’s population of slaves took place in four states – Virginia, North Carolina, South Carolina and Georgia – even after Congress prohibited the importation of slaves in 1808. Thomas Jefferson was at various times optimistic and pessimistic about the eventual abolition of slavery. He feared that the difference in color alone was enough to permanently divide the white and black races; and even if emancipation were accomplished, “deep rooted prejudices entertained by the whites; ten thousand recollections, by the blacks, of the injuries they have sustained … will divide us into parties, and produce convulsions, which will probably never end but in the extermination of the one or the other race.” By 1820 Jefferson was despondent over the problem of slavery, writing: “We have the wolf by the ears, and we can neither hold him, nor safely let him go. Justice is in one scale, and self-preservation in the other … I regret that I am now to die in the belief, that the useless sacrifice of themselves by the generation of 1776, to acquire self-government and happiness to their country, is to be thrown away by the unwise and unworthy passions of their sons, and that my only consolation is to be, that I live not to weep over it.” Jefferson’s fears were well founded – slavery would only be eliminated more than forty years later after a bloody Civil War at the cost of hundreds of thousands of American lives. D1.5.9-12. Determine the kinds of sources that will be helpful in answering compelling and supporting questions, taking into consideration multiple points of view represented in the sources, the types of sources available, and the potential uses of the sources. D2.His.12.6-8. Use questions generated about multiple historical sources to identify further areas of inquiry and additional sources. D2.His.15.6-8. Evaluate the relative influence of various causes of events and developments in the past. D2.His.16.9-12. Integrate evidence from multiple relevant historical sources and interpretations into a reasoned argument about the past. D3.4.6-8. Develop claims and counterclaims while pointing out the strengths and limitations of both. Review the lesson plan. Locate and bookmark suggested materials and links from EDSITEment-reviewed websites used in this lesson. Download and print out selected documents and duplicate copies as necessary for student viewing. Alternatively, excerpted versions of these documents are available as part of the Text Document for each activity. Download the two Text Documents for this lesson, available here as PDFs. These files contain excerpted versions of the documents used in the activities, as well as questions for students to answer. Print out and make an appropriate number of copies of the handouts for use in class. If your students lack experience in dealing with primary sources, you might use one or more preliminary exercises to help them develop these skills. "Using Primary Sources" from the American Memory Project of the Library of Congress includes a set of such activities. The Educator Resources section of the National Archives website also features a set of Document Analysis Worksheets. Time required for activity: One homework assignment, one class instructional period, and one class for student presentations. Print copies (or provide links) for students of the documents and analysis questions assigned for homework and class discussion (listed below, included in the Text Document for Activity 1). This activity is designed to give students a better understanding of the views of prominent American founders on slavery, the means they proposed for doing away with slavery, and the obstacles that prevented immediate emancipation. Students should gain a better understanding as to why Americans failed to eliminate the evil of slavery, despite the desire of many to do so. Divide the class into four groups, and assign for homework one of the reading sets (listed below) and the corresponding worksheet (available on pages 4–5, 8–9, 13–14, and 17–18 of the Text Document for Activity 1) to each group. Have each group meet to compare and discuss answers to the questions on their assigned worksheet (for Reading Set A, B, C, or D) for approximately fifteen minutes. The teacher should distribute the other reading sets and worksheets to all students. Shuffle the groups so that there are students from all four original groups (A, B, C, and D) in the new groups. With the remainder of the class period, allow students to answer the questions for all four worksheets, with the “experts” from the original groups leading the discussions that deal with their original reading sets. Divide the students into their original reading groups (A, B, C, and D). The teacher should lead a general discussion on the views of the founders regarding slavery, encouraging the students to clarify and elaborate on the documents they were originally assigned. This discussion can also be facilitated by listing the names of the founders included in the readings (Jefferson, Washington, Jay, Hamilton, Ellsworth, Mason, Martin, Sherman, Rutledge, Charles Pinckney, General Charles Cotesworth Pinckney, and Franklin) on the board, so that students can write words or phrases under each describing that founder’s thoughts, fears and hopes regarding slavery. Teachers can extend the lesson by assigning a 2–3 page paper on the views of the founders regarding slavery, incorporating evidence from all three reading sets. Print copies (or provide links) for students of the datasets and quiz sheet for the activity (included on pages 1–7 in the Text Document for Activity 2). The purpose of the activity is to provide students with an understanding of the measures that were taken in the various states either to eliminate or protect slavery. Students will see the effects of these efforts over time: for example, how the increase in the number of slaves intensified in Southern states after 1800, or how plans in Northern states for gradual emancipation had a tangible, cumulative effect between 1790 and 1810. Students will also see how the divide over slavery evolved into sectional lines between Northern and Southern states, setting the stage for the crises in the 1800s that would eventually culminate in the Civil War. Note: If teachers do not wish to use the online interactive version, or if internet access is limited, teachers should distribute the datasets and quiz sheet provided in the Text Document for Activity 2. That evening students should visit the interactive online activity. Here students will find a map of the thirteen original United States. By clicking on a particular state, a pop-up box will display key events that occurred in that state regarding slavery, as well as a dataset of information regarding slave populations (all data is based on official U.S. Census information for the years 1790, 1800 and 1810). Students may also click on the buttons for 1790, 1800 and 1810 to see census data for each year, as well as pie charts representing free and slave populations. After studying the information provided for each state, students should take the online interactive quiz, which will ask a series of twelve questions. Students are provided with three possible answers, and get two tries to answer the question correctly. After they take the online quiz, students should print out the page showing the final score on the quiz and submit it to the teacher on the following day. If students do not have access to the internet, they can answer the questions on the quiz sheet by using the event information and population data provided in hard copy form (available on pages 1–5 of the Text Document for Activity 2). If time permits on the following day, the teacher can lead a class discussion considering economic and environmental factors that would explain the growth of slavery in the southern states and its decline in the northern states between 1790 and 1810. Teachers can place the census data into political context by explaining, for example, the industrialization of the north, and the growth of the cotton economy in the south as a result of climate, the plantation household, the distribution of the cotton gin, and the growing demand for cotton from Great Britain. What did Thomas Jefferson mean when he wrote to John Holmes, “we have the wolf by the ears”? Why did John Jay and other founders believe that slavery was “an inconsistency not to be excused”? By what means did George Washington and other founders wish to see slavery ended in the United States? What were the obstacles to emancipation, according to many of the American founders? 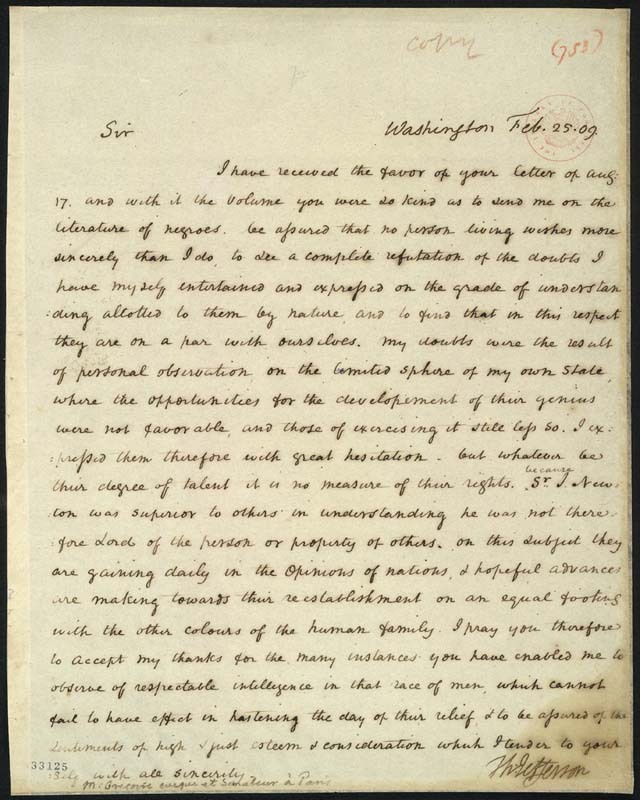 What did Thomas Jefferson mean when he wrote to Henri Gregoire, “Because Sir Isaac Newton was superior to others in understanding, he was not therefore lord of the person or property of others”? What were the views of founders regarding the character and intellectual abilities of slaves? Why did the slave population increase in some states and decrease in others between 1790 and 1810? What actions were taken in the original thirteen states either to eliminate or perpetuate slavery? If the American founders believed that slavery was unjust, why didn’t they abolish it immediately? Teachers can also consider a "Meeting of the Minds": Students assume the role of a state representative they have researched (a sample is provided below) and participate in a seminar as if they are that person. Students utilize research collected using primary sources, interpret those sources from the perspective of the person they are portraying, and participate in a discussion to persuade others and defend their positions. At the conclusion of the "Meeting of the Minds" discussion, students reflect on the research process, the discussion, and what they learned by arguing from someone else's perspective . Research when the states officially abolished slavery and where they have stood on other civil and human rights issues. Have students investigate who is missing from the discussion to learn their thoughts about slavery and abolition during that time.